Tidal Lagoon Power, the power project developer of the mega tidal project in the UK announced that it received approval to connect the 3.24GW tidal project to the national grid, changing the renewable energy landscape both in the UK and worldwide. The project will be located between Cardiff and Newport, in the Severn Estuary. Once completed, it will have an estimated electricity output of 5.5TWh per year, which according to the company is enough electricity to supply every single household in Wales. The development process for the project started back in 2013 and the formal application for a Development Consent Order is expected to be submitted in 2018. The 3,240MW project will trigger around £8 billion of private investment. Early estimates suggest that the tidal project will need more that 3,000 construction workers, and has the potential to create and sustain over 8,000 manufacturing jobs in both Wales and all over UK. 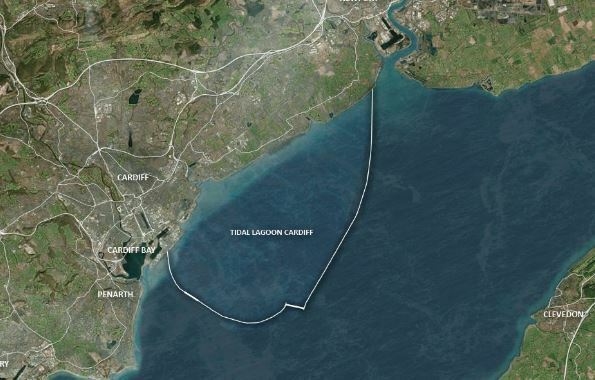 The Tidal Lagoon Cardiff power plant will comprise a 20.5 km breakwater wall, housing up to 108 tidal lagoon turbines and at least two powerhouse units, which would handle flows of around 600 million cubic meter of water on each tidal cycle. Tidal Lagoon Power is also developing a pilot scheme, located in Swansea, known as Tidal Lagoon Swansea Bay. The pilot project will have a total installed capacity of 320MW, and is set to define the final decision for the Cardiff follow-up project. It is set to comprise sixteen 23ft diameter hydro turbines and a six mile breakwater wall. Swansea Bay Tidal Lagoon will be the world’s first tidal lagoon power plant. Due to the incredible tides on the West Coast of Britain, by keeping the turbine gates shut for just three hours, there is already a 14ft height difference in water between the inside and the outside of the lagoon. Power is then generated as the water rushes through 200ft long draft tubes, rotating the 23ft diameter hydro turbines.